Upper class Families in Victorian Britain would have employed many servants, and the Farnhams of Quorn House on Meeting Street were no exception. Their footmen, coachmen and possibly other servants, would have worn a uniform, and these buttons were commissioned by the family from Firmin & Sons Ltd of London, to add status and individuality to the jackets. The Farnham coat of arms is a blue and gold shield, with two crescents. 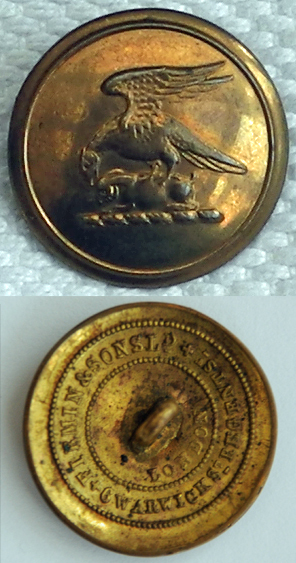 The crest above the shield depicts an eagle on top of a hare – and this crest is embossed into the family livery buttons. As in artefact 1960, a huge ‘thank you’ to Debbie, who contacted Quorn Village On-line Museum and enabled these items to return 250 miles back to Quorn!